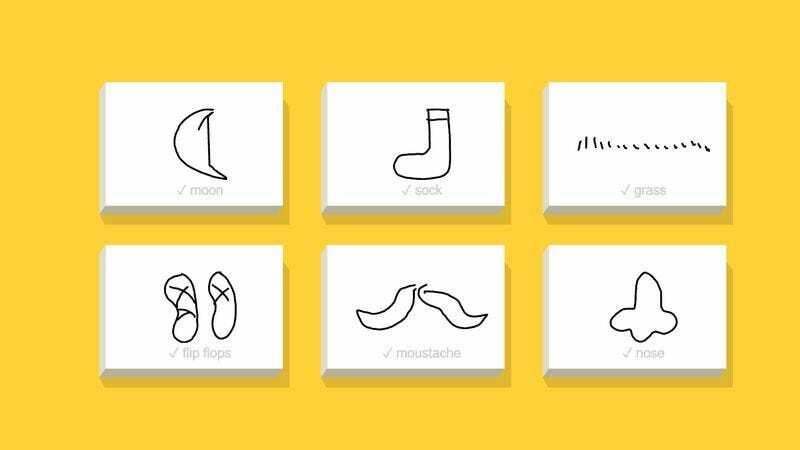 Ever wanted to play Pictionary with HAL-9000 from 2001: A Space Odyssey? How about a round of Win, Lose Or Draw with David from A.I. : Artificial Intelligence? None of those may ever happen, but Quick, Draw! comes damn close. Billed as “an A.I. experiment” from Google, this is essentially a drawing game in which the player is given 20 seconds to draw certain simple objects (a mustache, a sailboat, a calendar) in a way that a computer can understand. “Can a neural network learn to recognize doodles?” asks the welcome screen. “See how well it does with your drawings and help teach it, just by playing.” Even though this sounds like humans are being recruited to teach the machines how to think as part of some dystopian techno-nightmare scenario, Quick, Draw! is actually pretty fun. Web developer Jonas Jongejan and machine learning researcher Henry Rowley explain the project a little further in this YouTube video. Jongejan says that Quick, Draw! uses some of the same technology used by Google Translate to decipher people’s handwriting. The process depends not only on what a person draws, Rowley says, but also on how he or she draws it. Which lines are made in which order and in which direction? It’s important to teach a computer patterns, too. Doodles of cats may differ wildly, but they all tend to feature pointy ears and small noses. And here’s the best/scariest part: The more people who use Quick, Draw!, the better the neural network will get at recognizing drawings. Get ready for obsolescence, human race.